The mountains seem endless and I check my watch again. I think we must be near to landing but there is little sign of civilisation below. Then suddenly, without warning, we are out of the snow-capped peaks and descending towards Vancouver. 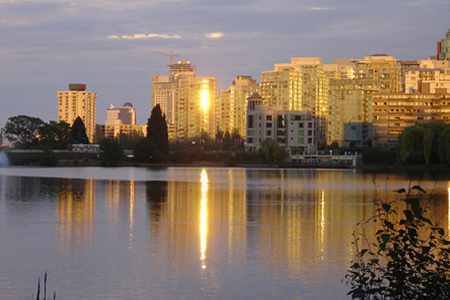 A cluster of skyscrapers mark the downtown area and point the way to the beautiful Stanley Park. Surrounded by water on three sides, the downtown peninsula of Canada's third largest city is breathtakingly beautiful from the air. I head first to the 1,000 acre Stanley Park but not without a little detour along the way. When I first visited Vancouver in 1995 the area between the park and the shopping district was a random collection of office blocks and run-down concrete buildings. Things have changed radically here. Now known as Coal Harbour it is one of the most desirable places to live. Huge apartment blocks have replaced the old worn-out buildings, and I decide to take a leisurely detour to look at the gardens and water features that surround each one. At the corner of Alberni and Broughton an example of Dale Chihuly's glass work can be seen. Further north, at Georgia and Broughton, an unusual office block has been converted into stylish apartments. It is a suspended cube which was designed to withstand earthquakes by hanging the building from a central concrete pillar. 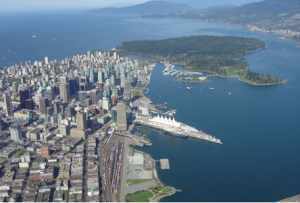 But don't worry, Vancouver only experiences minor earth tremors which you are unlikely to notice. On reaching Stanley Park I feel like I have wandered onto the middle of the freeway. Fast moving traffic whizzes past on either side with shouts of “on your left”, “coming through” or the occasional unrepeatable phrase. 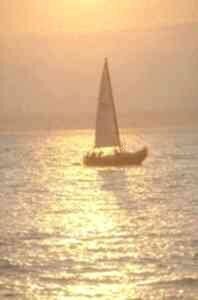 I've suddenly forgotten my left and right so I stand still and watch. Not a good idea. Some years ago the seawall walk around the edge of the park was divided into lanes – one for pedestrians, the other for cyclists and rollerbladers. I am standing in the wrong lane and about to get flattened by some very wobbly first-time bladers! Leisure is taken seriously here and no matter the time of day there are always experts and amateurs navigating their way along the seawall on wheels. After escaping the chaos of the seawall an air of calm descends as I walk into the interior of the park. Huge cedar trees invite you to look up at their great height. I am looking for the Hollow Tree - a giant tree that was once photographed with a car parked in its centre. But I soon become enchanted by the criss-cross of trails that take me deeper into the woods and decide to wander wherever they lead me. At Lost Lagoon I stop for a breather on one of the many benches throughout the park. Groups of ducks and swans are enjoying the midday sun. Suddenly, from behind my bench, out pops a racoon. It stops and looks at me for a moment then makes a barely audible noise. A baby racoon scurries out of the bushes to join its mother and the two scamper off down the path. I could spend the whole day here watching the wildlife and reading the inscriptions on the benches. 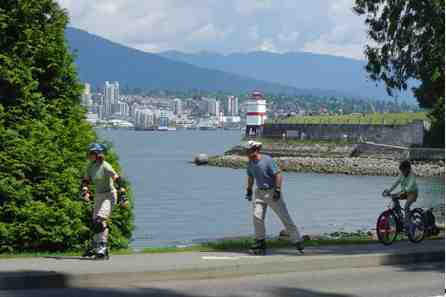 They are mainly devoted to loved ones who enjoyed Stanley Park as locals or visitors. But it is the one dedicated to the 'Secret Service Agent' that intrigues me most. However, there is so much more to see in Vancouver that I decide to leave the rest of the park — its lakes, restaurants, aquarium, totem poles, cricket ground and beaches — to another day. In the evening I wander along Robson Street, the main shopping street. There are the usual high street names here as well as many smaller shops. But I'm not here for the shopping. I find myself a window seat in a coffee shop and join in another of Vancouver's great pastimes: people watching. At any time of day you will always find people taking time out to enjoy a coffee and just watch the world go by. Judging by the crowds on Robson Street, most of the world is going by this evening. Although it is April, the evenings are pleasant enough for an after-dinner stroll (they eat early here; around 6-7pm is usual). The next day I take a leisurely walk down to the end of Hornby Street and after a short ride on an aquabus (small rainbow-coloured pedestrian ferries), arrive at Granville Island. Originally made from the mud dredged out of nearby False Creek, Granville Island is home to the prestigious Emily Carr Art Institute, craft shops, art galleries, an indoor market and — wait for it — a cement works. A whole day can be spent here just wandering around the shops and galleries, admiring the beautiful work on display. In the indoor market there is a choice of food from around the world. I can't resist trying one of the huge muffins with my coffee — the only problem is how to choose between all the tempting flavours! Outside I sit on a bench and watch yachts, boats, and aquabuses travelling up and down from English Bay to False Creek. A cement barge arrives to be unloaded. I imagine they need a lot of cement here. In the distance I can see the edge of Stanley Park and, rising up behind it, the ski resort of Grouse Mountain — my next stop. But first I wander to the end of the island, past the art school where I have been told there are some floating houses. I'm not really sure if these are boats or houses. They certainly look permanent, with gardens, washing lines and satellite dishes. But they are definitely floating in the water. 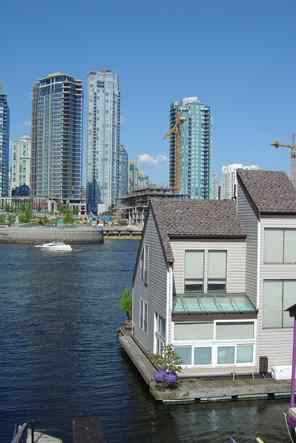 These are permanent homes, at the end of one of Vancouver's busiest tourist spots. I feel like I'm intruding so I leave to begin my ascent up Grouse Mountain. On the ferry, known as the seabus, which takes me across the Burrard Inlet to North Vancouver, I chat to a group of Americans and discover they are also planning to go up the mountain. “Why don't you join us?” they ask. “It should only take about an hour or so to get to the top.” An hour! I thought it was a quick ten-minute cable car ride. But that's not the way they are going up. I can join them and take the Grouse Grind, a gruelling 2km walk up to the top, often described as nature's Stairmaster. Or take the Grouse Mountain Skyride – the easy option. This turns out to be the best choice because the views from the cable car are spectacular. The skies are clear today so it is possible to see right across to Vancouver Island. Below the cars seem like ants on the Lions Gate Bridge which rises majestically out of Stanley Park and takes traffic across to West Vancouver and onto the Transcanada Highway. It's a bit of a shock arriving at the top. Below the weather was mild and sunny. Here it is cold and sunny — and there is snow! Nearly everyone is wandering around carrying skis or snowboards. Small children weave in and out between the crowds, some still on their skis, showing no fear. On the ice rink a mix of beginners and the slightly more practised wobble their way around. I queue up for the sleigh ride but I'm disappointed to see that it is pulled by a large tractor on treads rather than Rudolph's friends. However, it does take you to the far end of the resort, where the ski-lifts start and where you can see right across to Mount Baker, in Washington State. It is a magnificent sight, appearing to rise up out of nowhere. I'm told it's still considered an active volcano, although it is sleeping right now and has been since the mid 1800s. Scattered around the resort are huge wooden carvings of birds, people and animals. In the summer the Lumberjack Show gives visitors a chance to see how wood can be carved with just a chainsaw. At this time the two resident grizzly bears also come out of hibernation. Grinder and Coola are orphan bears who were brought to the mountain in 2001. They are part of an ongoing observation experiment to learn more about grizzlies. The aim of the project is to be able to save orphan bears and return them to the wild. There is also a pack of grey wolves here, who used to be film stars, but have since retired. After travelling back down to downtown, I am puzzled by the large orange arrows that seem to have appeared on street signs everywhere. Curious, I follow one and soon come across huge trucks and miles and miles of arm-sized cable. Vancouver is also known as Hollywood North. Many film-makers are coming here to use the city as a substitute New York or L.A. I-Robot and Catwoman were both filmed here, so it is not unusual to spot movie stars wandering through the shops. After shopping and snow I feel I need to add a little culture to my itinerary. Previously home to the Law Courts, the Vancouver Art Gallery occupies an entire city block between Robson and Georgia. The gallery changes its exhibitions throughout the year so it is best to check what is on before visiting. On the top floor is a permanent display of paintings by Emily Carr, one of Canada's best known female artists. Her stunning paintings of forests, totem poles and First Nation people are rich in colour and almost seem to be alive. I love looking at the photographs of her working by her caravan, always wearing her obligatory hairnet. On the ground floor, the gallery shop has a gorgeous selection of work by local artists, as well as a large range of art books. I am drawn to the jewellery cabinets which house modern as well as more traditional items, to suit most budgets. The staff here are very friendly and happy to open the cases for you to take a closer look or just to talk about the art. With my purse feeling rather lighter, I decide to get away from the shops for some quiet contemplation. 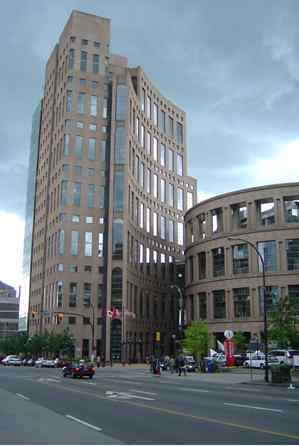 The Vancouver Library is a short walk east along Robson Street. Looking very much like the Roman Coliseum, it is an impressive building with a glass atrium dividing the library from the adjoining offices. You don't need a library card to wander around the floors and there are plenty of chairs for you to relax in while you read. An older but just as stunning building is the Marine Building on the corner of Burrard and Pender. Once the tallest office block in British Colombia, the exterior of this 1920s Art Deco building is decorated with friezes depicting Neptune and his creatures, interwoven with panels showing West Coast marine history. Inside the entrance hall continues the nautical theme on the floor and walls. Wait for an elevator door to open to be treated to the sight of the impressive wood panelling inside. For more historical buildings I head to Chinatown. The magnificent Chinese Gate greets visitors as they step over the threshold into one of the oldest parts of the city. Be warned, some of the streets around here are not very pleasant as this area is home to many vagrants and drug addicts. You are unlikely to come to any harm but it is safer to stick to the main streets. It may not be obvious at first glance but the Sam Kee Building on West Pender Street is the world’s narrowest building. A block on from this is Dr Sun Yat-Sen Chinese Garden. This is an oasis of calm and tranquility away from the busy streets outside. A guided tour is included which is well worth waiting for. The guides are very knowledgeable about the history of the garden and its creation. An interesting site for those seeking fun in the snow. But strange the menu items need 2 clicks in Explorer! If you enjoyed reading the above article then you will probably also enjoy Yellow Springs, Ohio, also in North America, and our latest articles covering the Orinoco Delta, La Mata, Marbella and Beijing.